It’s Thursday, time to go back to Hawaii (I miss Hawaii)! Eugene Roche makes the first of 5 appearances as Luther Gillis, a fellow private investigator from St. Louis, in Luther Gillis: File #521, written by Reuben Leder, with an original airdate of 6 October, 1983. 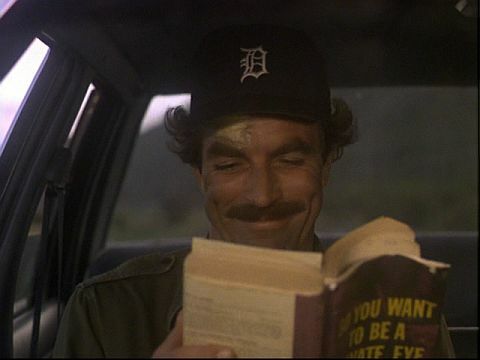 Thomas (Tom Selleck) is working on the case of a young missing girl, when the apartment he is in is busted into by Luther Gillis, working on the same case. But before either of them can figure out what exactly is going on, the police show up, and arrest them for suspicion of murder… there’s a dead drug dealer in the apartment. Neither one of the private investigators cares for the other’s style, and yet, they are both similar in a lot of fun ways… as we learn from the internal monologues that both of then get in this episode. Very enjoyable bit. Gillis fancies himself a bit of the old-school style of hardboiled detective (love the fact he has a book, like the one Thomas is always talking about), and butts heads not only with Magnum, but with Lt. Tanaka (Kwan Hi Lim) as well, who warns them both that they are both on the hook for this murder if they can’t fund out what really happened. As the case progresses, we learn Luther’s connection to the case, get to see Higgins (John Hillerman) teaching Karate to a bunch of silver-haired ladies, including Agatha (Gillian Dobb) and that perhaps the pair of investigators have more in common than they thought, and perhaps, they just may be able to find the young woman and save her. Smaller Than Life aired on 13 October, 1983 and was written by J. Rickley Dumm. While Thomas is laid up in hospital, due to a hang-gliding accident, caused by his desire to impress a Savannah (Lenore Kasdorf), Rick’s (Larry Manetti) childhood friend, Waldo (Cork Hubbert) shows up and asks for his old friend’s help on an insurance claim and find a missing figurine. But, surprise, surprise, not everything is as it appears to be, and Rick finds himself unsure of what is going on, and whether or not he can actually trust his once-treasured friend. Despite nagging misgivings, Waldo worms his way into Rick’s life and onto the estate, where eventually T.C. (Roger E. Mosley) and Higgins agree to help him, believing him to possibly be working for the government. But with so many lies, and different stories going around, who can be trusted, which version of the truth is real, and how much spycraft does Higgins really know? 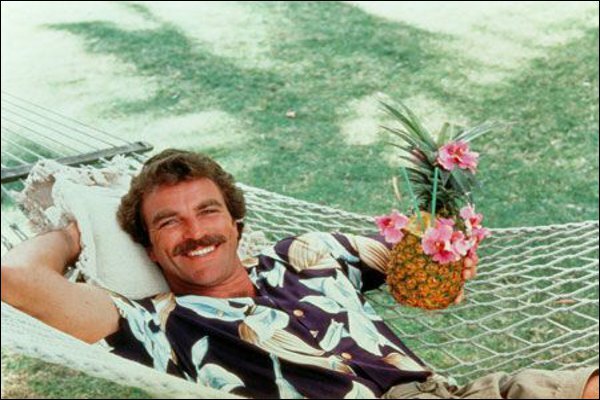 That’s all for this week, come back for more next week, until then Aloha!